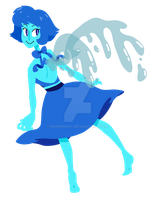 One of the best Lapis drawings I ever seen! This is absolutely gorgeous! I cannot tell you how much I love the mix of purples and blues, and the starry background is just perfect. The pool of water beneath her toes has another beautiful mix of purples and blues, and the while glow around it does wonders to show what Lapis is standing on. Speaking of Lapis, her outfit in this piece is stunning, and her skirt and her top are perfect. Her hair and face are well designed and colored, with her beautifully sad face and transparent water wings that give the starry background a nice blue tint (within the wings of course). I love this piece so much, and it's heading into my Favorites as soon as I am done writing this comment! Incredible job on this piece! Keep up the amazing work! OMGAH Thank you so much!